The Latham Carpet-Line Series offers a range of expansion joint covers that are suited to most floor and floor-to-wall applications in carpet flooring. The systems offer generous thermal and structural movement and shrinkage and will accommodate limited seismic movement.  Systems are available in Stainless Steel, Aluminium and Brass and with an insert plate in direct stick carpet applications to complement most facets of architectural design, whilst incorporating the required movement element. 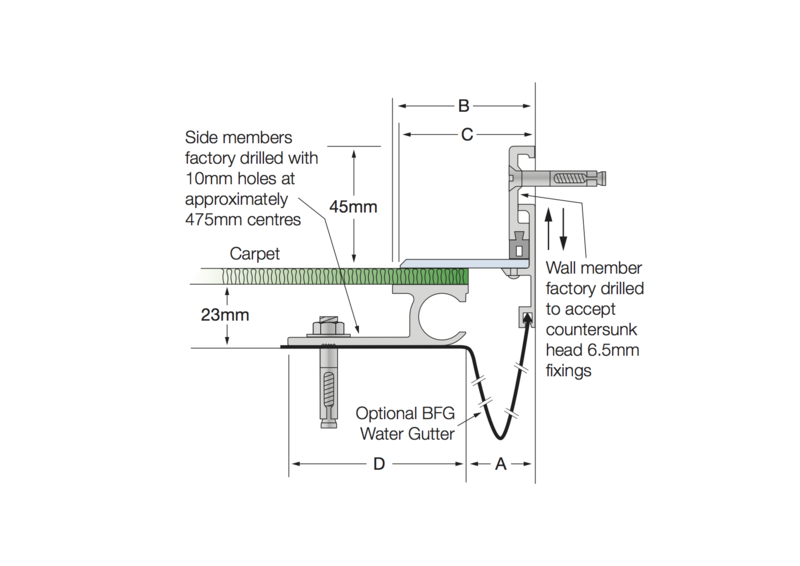 Carpet-Line Series floor and floor-to-wall expansion joint covers should be considered with Wall-Line Series wall and ceiling expansion joint covers. Larger movement capabilities & joint widths available on request. All measurements in millimetres. All mechanical expansion joint fixings by others. Aluminium, brass & stainless steel cover thickness may vary, see the detailed drawing at the links below for the exact detail & cover thickness. The Latham Carpet-Line Series Standard 30mm deep floor expansion joint covers are available with aluminium side member and stainless steel, aluminium or brass cover plates. This series can carry a VWS water gutter if required. The series has a depth below the finished floor height of 30mm, excluding the carpet and any underlay. The series can be set into a preformed recess with CA-16 Block-Out Anchors (supplied unless otherwise noted), in conjunction with mechanical fixings; or cast-into the slot when it is poured, with CA-6 Cast-In Anchors. The Latham Carpet-Line Series Standard floor and floor-to‑wall expansion joint covers are designed for normal pedestrian applications such as office buildings, hotels, foyers, shopping centres and airports etc. These joint covers should be used in conjunction carpet and underlay, direct stick carpet and carpet tiles. The systems offer various movements in 6 directions. The actual movement available will depend on the physical structural joint width and the installation width for the expansion joint cover. For full details of the joint covers see the data sheets below. The Latham Carpet-Line Series Standard 30mm deep floor-to-wall expansion joint covers are available with aluminium side member and stainless steel, aluminium or brass cover plates. 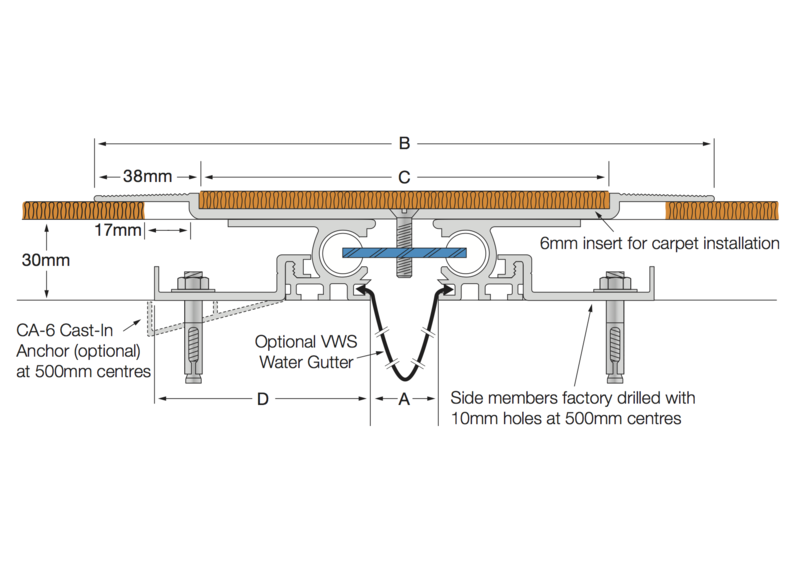 This series can carry a VWS water gutter if required. The series has a depth below the finished floor height of 30mm, excluding the carpet and any underlay. The Latham Carpet-Line Series Shallow 23mm deep floor expansion joint covers are available with aluminium side members and stainless steel, brass or aluminium cover plates. 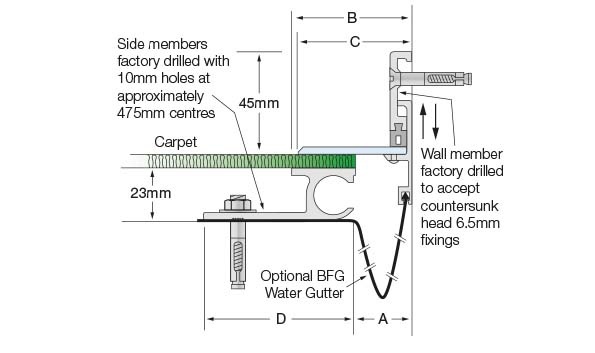 This series can carry a BFG water gutter if required. The series has a depth below the finished floor height of 25mm. The series is designed to be installed generally into a preformed recess although in some applications the product may not require a recess, depending on the type and depth of the floor finish. 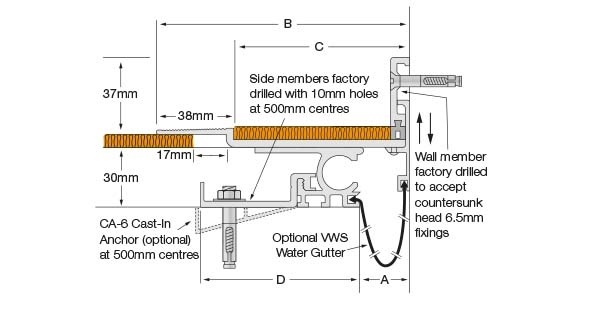 When the installation construction joint width exceeds 50mm the series can accommodate the Latham Fire Barrier System. The Latham Carpet-Line Series Shallow floor expansion joint covers are designed for normal pedestrian applications such as office buildings, hotels, foyers, shopping centres, airports etc. These joint covers should be used in conjunction carpet and underlay, direct stick carpet and carpet tiles. The systems offer various movements in 6 directions. The actual movement available will depend on the physical structural joint width and the installation width for the expansion joint cover. For full details of the joint covers see the technical drawings available from Latham Australia.. The Latham Carpet-Line Series Shallow 23mm deep floor-to-wall expansion joint covers are available with aluminium side members and stainless steel, brass or aluminium cover plates. 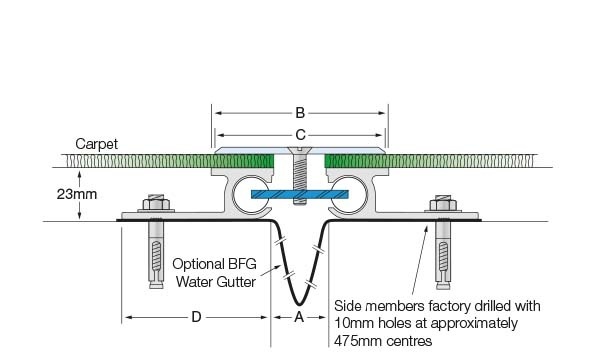 This series can carry a BFG water gutter if required. The series has a depth below the finished floor height of 25mm. The series is designed to be installed generally into a preformed recess although in some applications the product may not require a recess, depending on the type and depth of the floor finish. When the installation construction joint width exceeds 50mm the series can accommodate the Latham Fire Barrier System. The Latham Carpet-Line Series Shallow floor-to-wall expansion joint covers are designed for normal pedestrian applications such as office buildings, hotels, foyers, shopping centres, airports etc. These joint covers should be used in conjunction carpet and underlay, direct stick carpet and carpet tiles. The systems offer various movements in 6 directions. The actual movement available will depend on the physical structural joint width and the installation width for the expansion joint cover. For full details of the joint covers see the technical drawings available from Latham Australia. The Latham Carpet-Line Inlay Series 39mm deep floor expansion joint covers are available in aluminium. This series can carry a VWS water gutter if required. The series has a depth below the finished floor height of 30mm, excluding the carpet. 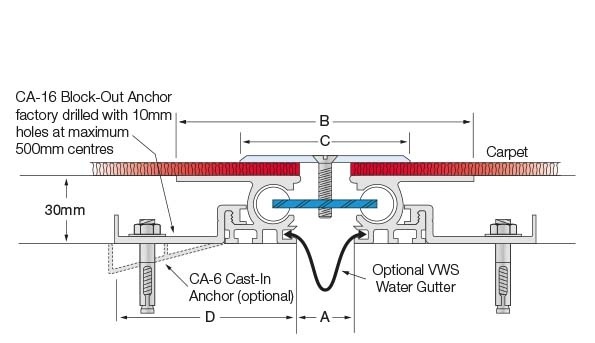 The series can be set into a preformed recess with CA-16 Block-Out Anchors (supplied unless otherwise noted), in conjunction with mechanical fixings; or cast-into the slab when it is poured, with CA-6 Cast-In Anchors. The Latham Carpet-Line Inlay Series floor expansion joint covers are designed for normal pedestrian applications such as office buildings, hotels, foyers, shopping centres, etc. These joint covers should be used in conjunction with direct stick carpet and carpet tiles. The systems offer various movements in 6 directions. The actual movement available will depend on the physical structural joint width and the installation width for the expansion joint cover. For full details of the joint covers see the technical drawing available from Latham Australia. 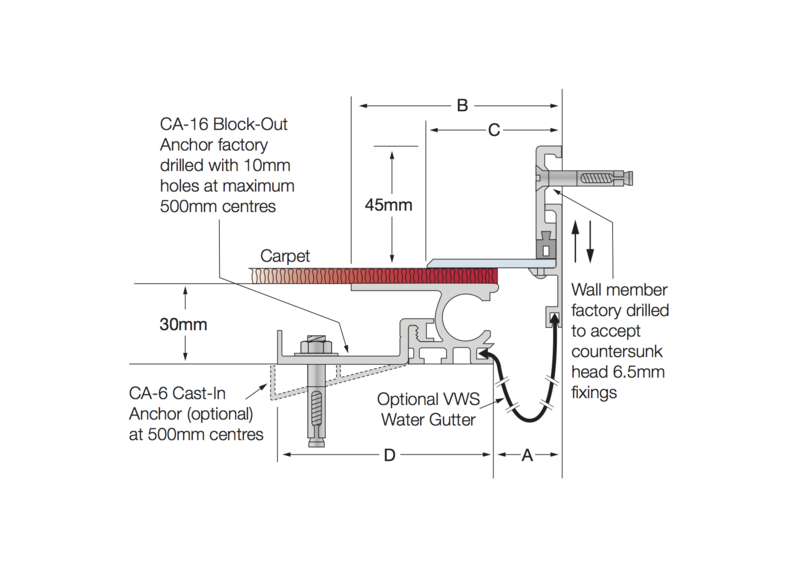 The Latham Carpet-Line Inlay Series 39mm deep floor-to-wall expansion joint covers are available in aluminium. 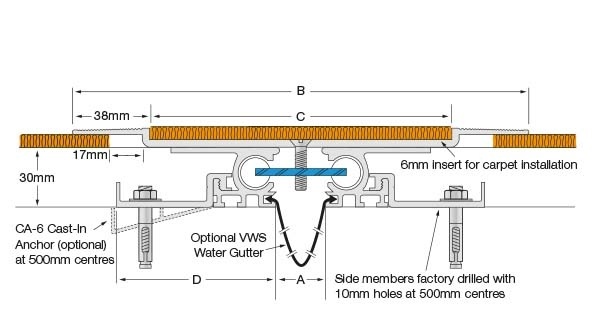 This series can carry a VWS water gutter if required. The series has a depth below the finished floor height of 30mm, excluding the carpet. 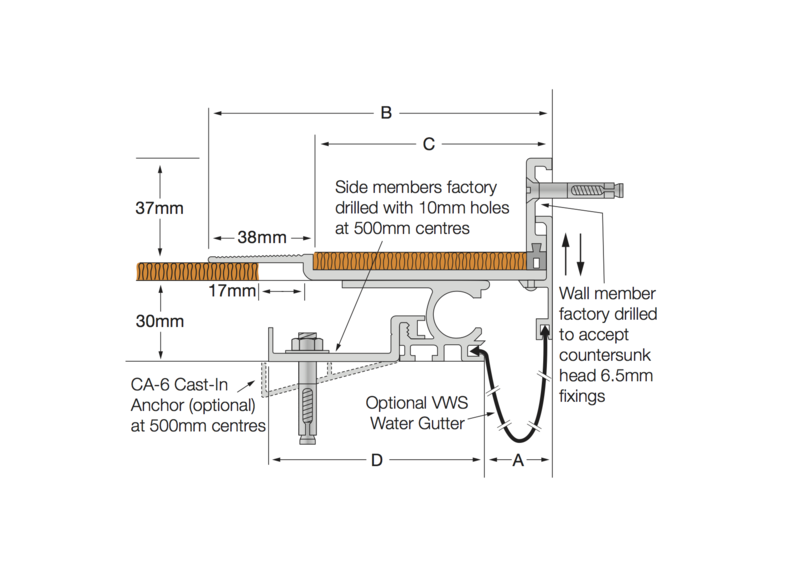 The series can be set into a preformed recess with CA-16 Block-Out Anchors (supplied unless otherwise noted), in conjunction with mechanical fixings; or cast-into the slab when it is poured, with CA-6 Cast-In Anchors. 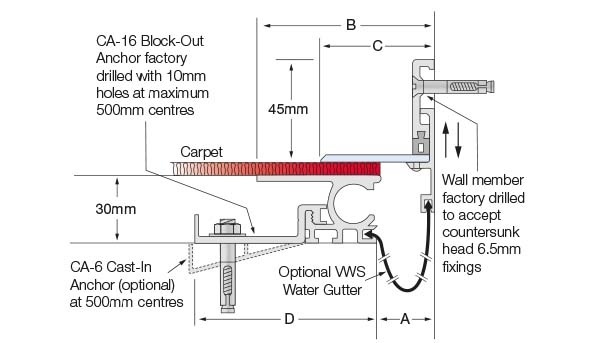 The Latham Carpet-Line Inlay Series floor-to-wall expansion joint covers are designed for normal pedestrian applications such as office buildings, hotels, foyers, shopping centres, etc. These joint covers should be used in conjunction with direct stick carpet and carpet tiles. The systems offer various movements in 6 directions. 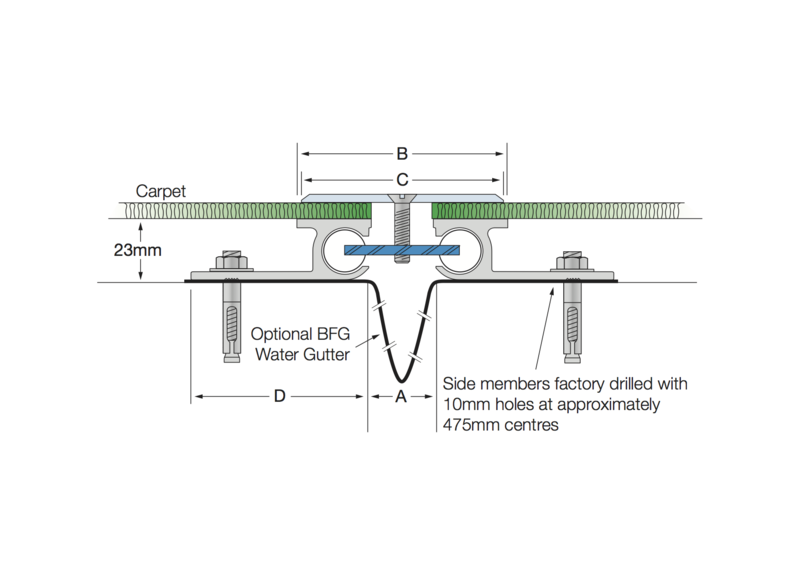 The actual movement available will depend on the physical structural joint width and the installation width for the expansion joint cover. For full details of the joint covers see the technical drawing available from Latham Australia.